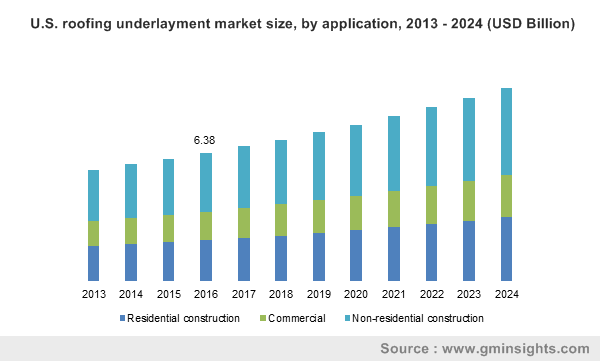 Roofing Underlayment Market size was more than USD 29 billion in 2016 and will witness 5.5% CAGR during the projected timespan. Rising residential building construction particularly in Asia Pacific will be a significant factor propelling the growth of roofing underlayment market in the near future. The regional construction industry is positively influenced by adoption of building codes specifying synthetic roofing underlays. Increasing builder interests for installation of water-resistant and flam-resistant underlays in commercial structures with tiled and metallic roof will further stimulate industry growth. According to the United Nations, world population is projected to exceed 9 billion by 2050. Increasing infrastructural requirements by the rising population will also feature positive outlook for the market in the forecast timeframe. North America and Europe roofing underlayment market growth will be particularly attributed to the residential reroofing activities. Stringent environment regulations in these regions will encourage the consumers for renovation activities to make buildings environment-friendly. This trend will propel the demand for roofing underlayment in these regions. Volatile organic compounds (VOC) emissions involved in the production of asphalt-saturated felt, rubberized asphalt is subjected to stringent regulations by REACH and EPA. This will be a significant challenge faced by the global market players over the forecast period. Global market was led by non-bitumen synthetic with revenue over USD 12 billion in 2016. Roofing underlayment market has observed a major inclination from traditional asphalt saturated felt to non-bitumen in the recent years. The trend is ascribed to enhanced features and performance of synthetic underlayments, for instance, non-bitumen synthetics are light weight and thinner than asphalt felts. Non-bitumen synthetic underlayments involve usage of polypropylene, polyester, fiberglass and polyethylene. They provide resistance against wrinkles, telegraphs and exhibit promising performance such as resistance to tears & leaks and installation ease. Synthetic underlayments also facilitate unique walking pattern and slip resistance over the roofs due to the proprietary formulation. Asphalt-saturated felt roofing underlayment market will witness growth close to 4.5% by 2024. 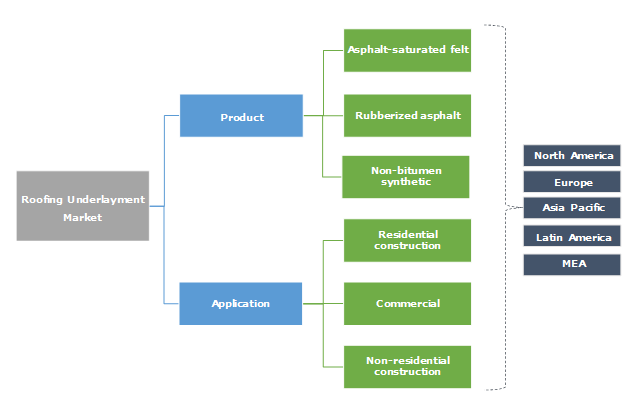 However, the segment will lose some share to non-bitumen synthetic roofing underlayments by 2024 due to penetration of synthetic products across residential and commercial applications. Preference to synthetic underlayment over asphalt felts might act as the inter-industrial growth restrain by 2024. Pricing has been a key driver for the deviation between asphalt felts and non-bitumen synthetics. Since non-bitumen synthetic underlayments are expensive, contractors with lower construction spending capacity prefer asphalt -saturated felts or rubberized asphalt roofing underlayments. Roofing underlayment market was led by non-residential construction applications in 2016 and will exhibit gains over 5% by 2024. Increasing maintenance and renovation in non-residential construction segment due to increasing government spending to improve public infrastructure will complement business growth. For instance, government of Saudi Arabia and other counties in the Middle East are heavily investing in non-residential segment. Roofing underlayment market size for residential construction will exhibit highest gains of 6% over the forecast timeframe. Strong growth will be chiefly attributed to increasing number of residential projects in Asia Pacific counties including India and China. Asia Pacific led the overall roofing underlayment market size in 2016, in terms of both volume and value, on account of astonishing rates of industrialization, urbanization along with population rise. Foreign direct investment (FDI) has stimulated the construction industry in Asia Pacific. India has been witnessing significant interest from international investors in the infrastructure space on account of the ongoing government social and public mega infrastructure projects. The growing construction industry in Asia Pacific present brighter growth avenues for market by 2024. MEA market, led by UAE and Qatar, will also observe significant growth in the forecast timeframe. The region had generated close to USD 1.5 billion in 2016 and is expected to grow over 5.5% CAGR over the forecast timespan. GCC government’s vision and plans towards the recovery of infrastructure and tourism sectors will propel the regional roofing underlayments market size by 2024. Major growth drivers for the construction industry in MEA include population growth, and rise in due to hosting of mega projects such as: Abu Dhabi Vision 2030, Expo 2020 and FIFA World Cup 2022. Key roofing underlayment market players are Owens Corning, Carlisle Companies, Atlas Roofing, DuPont, CertainTeed Corporation, GAF Materials, Gardner-Gibson, IKO Group, GCP Applied Technologies, etc. Industry players have been engaged in presenting innovative solutions through extensive R&D for attaining competitive advantage in the business. For instance, Tyvek Protec roofing underlayments by DuPont feature a unique embossed pattern that features extensive secondary moisture protection, wrinkle-free surface for smoother installations and improved grip and traction while walking on the roof. DiamondDeck non-bitumen synthetic underlayment by CertainTeed Corporation involves the additional advantage of scrim reinforcement for added slip resistance, in wet surface conditions. Roofing underlayment is a waterproof barrier or water-resistant material which is installed between a roof deck and roof covering and is used in a steep-slope roof construction. It serves as an added layer of protection from severe weather conditions. Various advantages imparted by roofing underlayments include: weather barrier against water, snow, ice penetration through the flashings or roofing; roofing protection from any resins that bleed out of the sheathing, etc. Underlays serve as insulators and provide complementary protection against leaks. Prevailing types of roofing underlayments include: asphalt-saturated felt, non-bitumen synthetic underlayment and rubberized asphalt. The industry will have significant growth aspects in the future years with innovative roofing techniques from the industry participants.